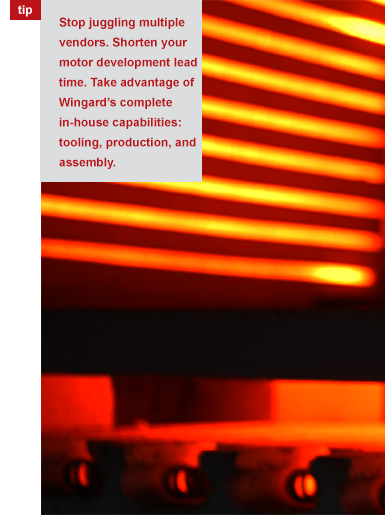 To help engineers achieve optimal motor performance, Wingard fine-tunes its annealing processes. We specialize in annealing laminations. Beyond standard stress-relief annealing of Silicon Iron and similar laminations, we anneal aerospace materials. For example, we can provide a pure, dry hydrogen atmosphere at special temperatures to balance strength and magnetics in laminations made from nickel or cobalt alloys. We can also apply a thin oxide layer to improve resistivity. Magnetic properties of aerospace materials are improved during the annealing process. We also perform specialized magnetic testing to verify exact standards. We verify the annealing process by performing sample testing according to ASTM standards. All test results are saved and reporting can be provided. You can rely on Wingard & Company for the correct setup, equipment and controlled treatment atmosphere, whatever the selected material.